When it comes to feeling confident and comfortable in our own skin—we know it can be … well, hard! Between finding the right clothes to fit our body and discovering our personal style, getting dressed can often feel like more of a chore than fun—even for our favorite fashion bloggers—who make getting dressed look effortless and amazing. 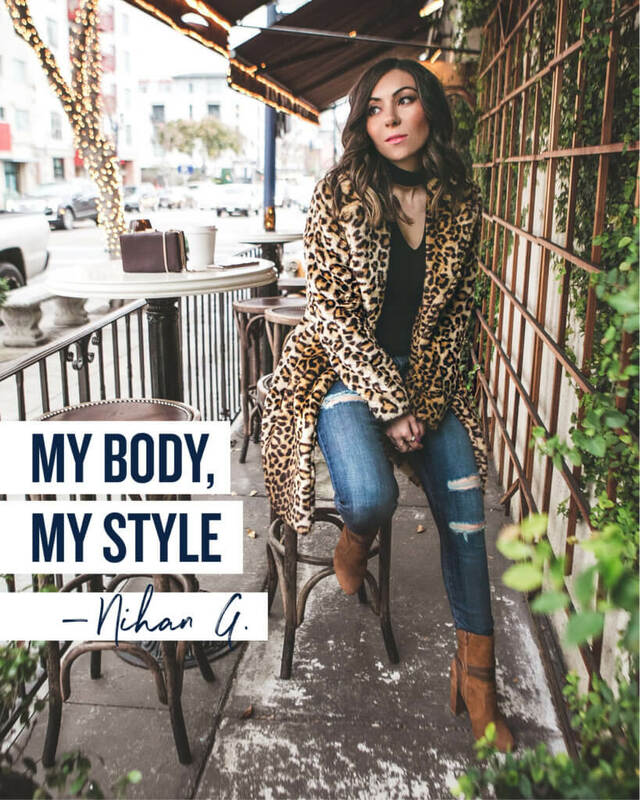 Keep reading to see how Style With Nihan learned how to dress her body! Pant/Dress Size: 2 (or I go one or two sizes up if I’m going for a more casual and relaxed look). My personal style is street style focused, romantic, edgy, versatile and always chic. Has your body shape informed the way that you dress? Absolutely! For example, I’m not very tall so maxi dresses look long on me and that’s why you won’t see me wearing them often. Another example is that I prefer to wear high-heels rather than flats because of the same reason. I love the height that heels give me, and I feel more confident in them. What are your three most figure-flattering pieces and why? High-waisted jeans because I love looking as elongated as possible. Biker jackets because they instantly add an uber cool, “Hey I’m a boss babe and zero F’s given” vibe to every outfit. I have biker jackets in lots of different colors—my recent favorite being an embroidered & studded number. The silhouettes are usually very similar and I prefer shorter styles that end around my belly to balance my height. The best part about biker jackets is that they’re super comfortable! I’ve never had a biker jacket that’s not comfortable. High-heels because they’re the easiest way to look longer and glamorous in an instant. What outfit makes you feel amazing? A black patent leather mini skirt and a black semi-sheer bell sleeve bodysuit. How did you learn to dress for your shape? By experimenting and taking pictures. Even before I had a blog, I used my friends and even my co-workers to take photos of my daily outfits. Seeing how you look in photos can help you understand what looks flattering on you and what is not working. Any styling tips and tricks you can share? Always have an emergency #OOTD in your car and home. When you have to go to a last minute event or date after work, it will save your life, trust me! It doubles as a lifesaver for your “I have nothing to wear —insert sadface—kinda days” or when you’re too lazy to pull off a fancy look. My emergency #OOTD includes a pair of high-waisted jeans, a relaxed boyfriend tee, a biker jacket and a pair of metallic pumps. That’s what I call effortless chic!